WestLAND Group’s surveying and mapping capabilities are second to none. Complete and accurate surveys and mapping information lay the foundation for all subsequent design and construction work and WestLAND Group’s capabilities and adoption of technological advances are always on the forefront of taking the survey and mapping profession to the next level. WestLAND Group is transforming the way surveying work is done through the adoption of innovative technologies, providing real efficiencies and cost savings by enhancing data capture, analysis, and presentation process. The future is here and WestLAND Group is at the forefront of this technology providing an abundance of innovative and creative solutions for our clients. 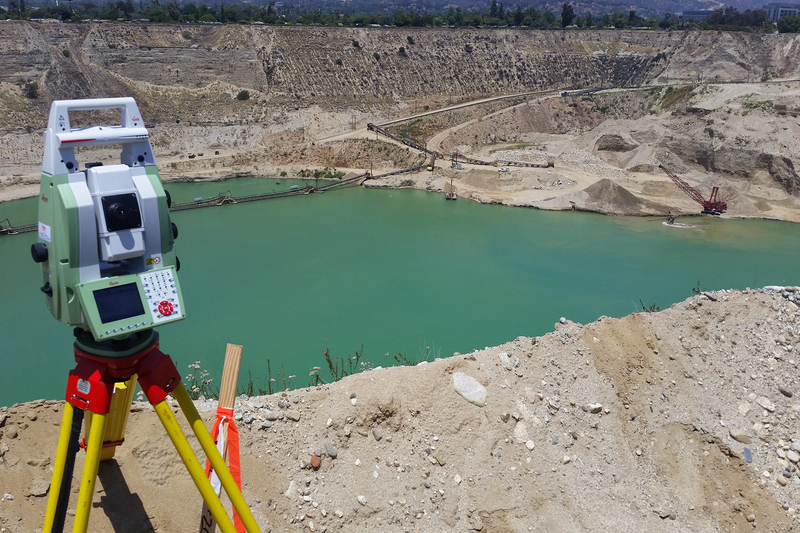 Client: City of Irwindale Location: Irwindale WestLAND Group performed numerous mining pit surveys as part of an on-going effort to support the mining engineering group within the City of Irwindale. WestLAND performed research and mission planning and established aerial control for photogrammetric and bathymetric surveys, including GPS/GNSS surveys and conventional surveying techniques. With the use of a dual frequency echo-sounder we were able to accurately produce a lake bottom profile that was used to estimate under water material extraction quantities. Irwindale-3 Topographic and Boundary survey maps were prepared for eleven open mining pit locations within the city. WestLAND office personnel generated digital terrain models (DTM’s) at each location and performed quantity/volume calculations for the city to verify the amount of material removed in a year over year comparison. The client also required detailed slope analysis for which our in-house staff created color-coded slope exhibit maps used to identify slope areas that were out of compliance with specified slope stability and safety requirements. As an additional service we prepared finished surfaces for future mining pit reclamation; used to calculate fill volumes that will be required during mine close-out procedures. Digital survey data and mapping deliverables were also exported into a GIS deliverable format, including shape files and geodatabase files to be incorporated into the city GIS system. This construction project included reviewing civil, architectural and structure plans and generating RFIs for any discrepancies found with regards to the building layout. WestLAND survey crews established horizontal and vertical survey control throughout the site and provided multi-story building control lines and elevations for the construction of this 6-story hospital building located in the City of Murrieta. WestLAND also prepared various as-built surveys to check concrete floor deflections and structural steel. This 2 mile drainage rehabilitation project along Hellman Ave., included reviewing civil and structural plans with regards to the design, established horizontal and vertical survey control throughout the project, monumented street centerlines, and provided control lines and elevations for the construction of the improvements. WestLAND also prepared various as-built surveys to verify design along the route and our field engineers prepared additional designs to fit field conditions. This construction project included reviewing civil, architectural and structural plans and generating RFIs for any discrepancies found with regards to the bridge layout. WestLAND survey crews established horizontal and vertical survey control throughout the site and provided control lines and elevations for the construction of the overpass, located in the City of Vernon. WestLAND also prepared various as-built surveys to check concrete and structure deflections.